May 24th, 2018. We are pleased and proud to announce the fifth scholarship for the class of 2018 was awarded Hinsdale Central. This scholarship is valued at $1,500 annually, renewable for four years and is valued over 4 years at $6,000. This is a category 1 scholarship. That’s what the KJO memorial scholarship is about, helping our children reach their fullest potential of kindness, compassion, caring, and leadership. Our scholarship is a bit different in that we want to acknowledge and appreciate those that make the school a kinder and gentler place in their own way. We ask for an unweighted GPA of 3.0. We ask the applicant play a sport for 3 years in high school. We ask the applicant write an essay and describe how they demonstrated, how they lived, their compassion and caring. Tennis Player, yes Kelli was a tennis player too, but that’s not a requirement. Any sport played for 3 years in high school satisfies the requirement. This year’s recipient excels in the classroom and gives back to others. Their essay was about their eagle scout project, a service project to distribute backpacks with winter supplies to help the homeless during winter. Oh Yes, they’re an Eagle Scout too. Allow me to read some of this introduction to you..
#1 In a past life, I would be René Descartes, a renowned philosopher. #3 I am unhealthily obsessed with roasted red pepper hummus. Now, I promise that I’m not crazy: I simply see the world differently. 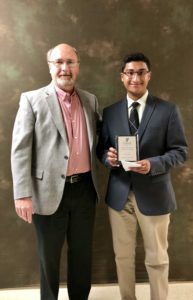 The Kelli Joy O’Laughlin Memorial Scholarship is awarded to Sachin Shiva.